Peter Kahl has been the first who successfully bred T- Albino Boas. This is the reason why they are known as the “Peter Kahl Strain” or “Original Strain”. There´s another T-Albino line existing – the Sharp Albino, first bred by Brian Sharp. These two lines aren´t compatible what is important to know and has to be considered when you´re buying your first animals so you don´t get disapponted when you breed them. There´re also T+ Albinos existing – please check the folder VPI T+ Albinos to learn more about the difference. T- Albino´s aren´t able to produce black pigments, but red and yellow. This is leading to a beautiful red / yellow appearance but often also tends to become yellowish when they mature. Combinations with Jungle, Hypo, Blood, Pastell or Bcc blood influence (Lipstick line) are increasing the amount of red and also improve the appearance of the animals a lot and cause that they even look more beautiful with every shed! Since many years, Albinos are in combination with other morphs, the key to many other designer morphs like e.g. 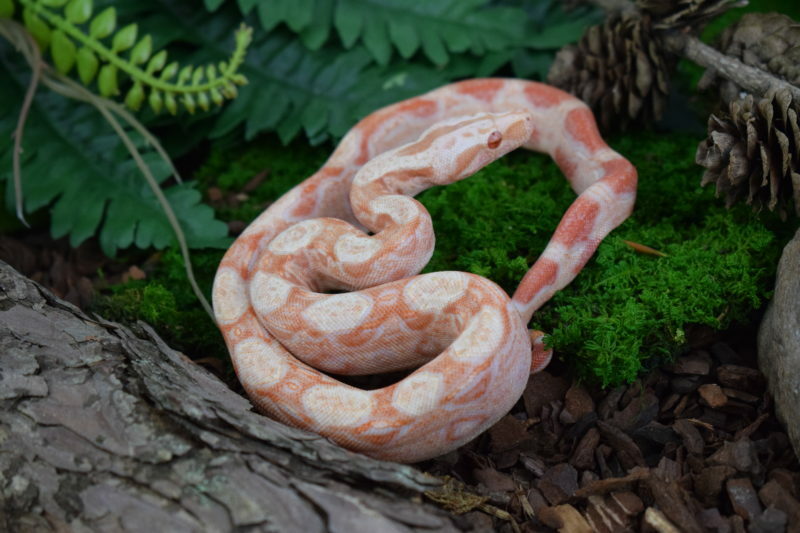 the Sunglow (Hypo Salmon + Albino), the Snow boa (Anery + Albino or the famous Moonglow (Hypo Salmon + Anery + Albino) and of course not to forget the combinations with all the pattern morphs that still haven´t been done all yet.